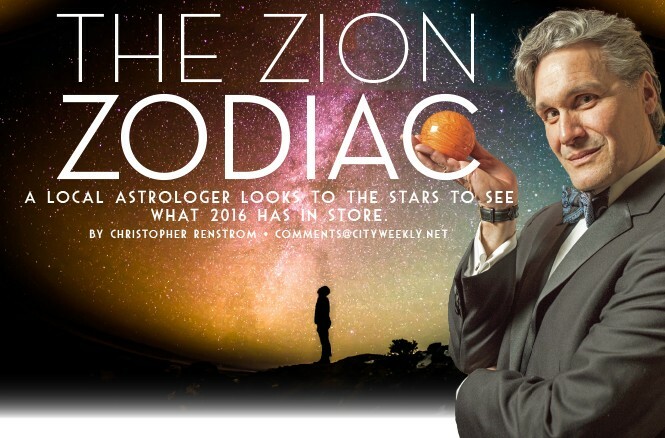 Local astrologer Christopher Renstrom looks to the stars to predict what 2016 has in store. Astrology is not a science. Astrology is not a religion. What astrology is, is a calendar. It's why every great civilization on this planet—be it Mesopotamian, Mesoamerican, Chinese or Indian—created some form of astrology. It was in order to tell time. In astrology, everything is seen from the Earth's point of view. We know, scientifically speaking, that planets orbit the Sun, the star at the center of our solar system. However, in astrology, the horoscope (or astrological chart) is set up to show that the planets orbit the Earth. It's not such a farfetched concept when you consider how the Sun rises in the east in the morning, travels across the sky during the day, and then sets in the west at night. In fact, we can tell time based on where the Sun is in the sky. This is exactly what ancient astrologers did. Only they added an entire cast of characters to their celestial clock. In addition to the Sun, there was the Moon, Mercury, Venus, Mars, Jupiter and Saturn. Each of these "planets" rose in the east, traveled across the nighttime sky and set in the west. Sort of. Orbital speeds being different, there were times when some planets disappeared from view altogether because they were traveling across the sky during the day and therefore invisible to the naked eye. But records were made of the planetary orbits, and these were used to predict risings, settings, disappearances, reappearances, retrogrades, apogees and perigees. All of this was cataloged and recorded exhaustively by court astrologers who were the forerunners to astronomers. Astronomy wouldn't exist if it weren't for astrology. Neither would trigonometry, for that matter. Hipparchus—the "father" of trigonometry—was a practicing astrologer. He used trigonometry to accurately predict solar and lunar eclipses. These were important events in astrological prediction. Astrology is often portrayed as the favorite bogeyman of the superstitious. It's said that astrology takes away the freedom of choice and demands we cower to the planets. However, astrology gave us our first calendar, one that showed it took about 365 days for the Sun to return to the place in the sky where it was when we began clocking it. And when you divided those 365 days into quarters you came up with the equinoxes and solstices—pivotal points that described when the Sun was "rising" (spring), at its "noontime" point (summer), "setting" (autumn), and then its "midnight" point (winter), when days were shortest and nights were longest. Now, you wouldn't want to plant seeds in the winter or expect to reap a harvest in the spring. You could, but you wouldn't be very successful. Astrology basically told you the time to launch your various ventures and enterprises. If there were a time to plant and a time to reap, then it only made sense that there was a time to go to war, to marry, to have a child, build a temple or make a major purchase or investment. Astrology doesn't tell you what to do as much as it tells you when to do it. And that is the purpose that astrology still serves today. Think of it as a cosmic weather map and traffic report all wrapped up into one. Astrology's purpose is to help you get to where you want to go based on the disposition of the planets. Are they helping or hindering you? If they're hindering, what can you do about it? As you read your 2016 predictions, you will see for yourself the times of year that are auspicious and the times of year that are full of obstacles. This is no different than consulting the Weather Channel to see if you need an umbrella, or tuning into your radio station to see if you need to take an alternate route to get to work. Astrology is perhaps one of the greatest inventions that our civilization has ever conceived. No one has been put to death because astrology decreed it. Nor has anyone been excommunicated, persecuted, experimented on or nuked. Astrology is here to help us to realize our potential and maximize our resources. And it also teaches us that each person was born with an individual horoscope and is therefore a child of the stars. There are no borders or ideologies in the heavens—just stars to guide our ships by. Something's got to give. You feel out of sync and out of sorts, and it's this internal restlessness that's driving loved ones, friends, and co-workers crazy. Nothing seems to sit right, which is why you're resisting their advice and poking holes in their homespun wisdom. Clearly, the change you seek must come from within. But don't expect any parting of the clouds, burning bushes or bolts from heaven to point the way. Thankfully, Mars in Scorpio on Jan. 3 gives you the gumption and drive to do whatever it takes to escape the rut you're in. Indeed, you could be severing ties, pulling up stakes or relocating as early as Feb. 7. The end result will be you settling into a happier, healthier groove by your birthday. Unfortunately, Mars turns retrograde on April 17. Retrogrades are the "do-overs" in astrology, they signal a time when you will be pulled back into a situation that you thought you had wrangled free of. Mars retrogrades usually involve difficulties with men so you could be locking horns with a nasty competitor, a cheap boss or a deadbeat partner. Nevertheless, Mars—the warrior planet—is your astrological ruler, which means that you'll come out on top in August. By September, you'll once again feel like you've crossed the finish line only to be left wondering: Is that all there is? Somehow, the things you fought for just aren't fulfilling you like you thought they would. You may feel like you should embark on a different path in November and December—something more spiritual and exotic?—but the stars show that the answer you seek lies closer to home. Have you thought about giving back? Consider doing volunteer work, mentoring or coaching. Helping people to help themselves may connect you to that higher purpose you've been searching for. You were born under a peace-loving sign. You have a "live and let live" attitude and you pride yourself on being a low-maintenance personality. Hardworking and protective, you're everyone's go-to Rock of Gibraltar. The only things you ask for in return are respect, peace of mind, and for people to keep their hands off your stuff. Unfortunately Mars, the planet of strife, will be mixing it up in your horoscope throughout 2016. It's Mars' job to test your mettle by provoking you to fight for what's yours. This will be especially evident from January to March when you will have to confront a colleague who's horning in on your turf or a business partner who's making a grab for more than his fair share. You will prevail because if anyone knows how to block an unstoppable force, it's an immoveable you. But be forewarned that relations with your nearest and dearest will be strained from May 27 to Aug. 2 when Mars is moving in and out of retrograde. This is when the people who are burdening you with their troubles just can't help themselves. They really are going through a rough patch. They could be out of work, short on funds, not in the best of health or weathering a very painful episode that leaves them feeling depressed and overwhelmed. Be patient and supportive because the gloom will lift in September. The years ends on a high note when you are approached by a headhunter or a high-profile agency. This is your chance to showcase your talents in a different setting and increase your earning power. The only catch is that it may require a move. That could be a deal-breaker, but meet with this person, anyway. At least, it provides an ego boost at a time when you could use it. This year's eclipses occur in both the highest and lowest points of your horoscope auguring dramatic ups and downs. Thankfully, you were born under quick-witted Mercury so, if anyone can turn a setback into a stride forward or exploit the thinnest sliver of opportunity, it's you. The solar eclipse on March 8 shows you taking charge of your destiny. You may graduate from school, master a discipline you've been practicing or assume a role that you've been preparing for. This is also when you will claim something that is rightfully yours—like a title, an entitlement or even a piece of property. The period between March 23 and May 26 shows you struggling with the consequences of this action. We are often told to be careful what we wish for because it might just come true; St. Teresa of Avila once said: "More tears are shed over answered prayers than unanswered ones." But, then again, Geminis are famous for turning life's lemons into lemonade and then selling it at a profit. Saturn, the planet of trials and tribulations, will continue to weigh heavily on your relationships. This often coincides with romantic dry spells or times where you and your partner act more like roommates than lovers. Thankfully, Jupiter's change of signs in September will revive your love life from that coma it's been under. September also shows a major shift in your home, family life and ties to the past thanks to the lunar eclipse on Sept. 16. This carries you through the end of the year as you'll be working to get your house in order both figuratively and literally. Clearing away the deadwood isn't easy, but you're doing this in order to set up the life you want to live. If there was ever a time to make bold moves, it's in December. "Change is good." That's your mantra for 2016. This won't be an easy concept to wrap your mind around because you value security over risk and consistency over caprice. But, there comes a time when doing the same old, same old just doesn't cut it anymore. It's something to think about on March 23 when the lunar eclipse shows that you can't get to where you want to be unless you cut ties with a situation that's been stifling you. It's a hard choice but an easy decision because you'll get your life back. And with that comes a flood of opportunities. The period March 23 to Sept. 9 is an extraordinary time. If you've been casting about for a new direction in your career—like exploring another line of work or applying for a job out of state—then this is when you will meet with success. If you've been looking to launch a business, then the alignment of planets couldn't be more favorable. But don't ignore the opportunities that lie close at hand. You don't have to walk out on everything to reinvent yourself. Consider taking up an old talent that's been collecting dust. You may find that you have a better feel for it now than you did before. Life at home improves in October and November when you decide to move with the forces of change rather than try to stop them in their tracks. Like you, loved ones are also undergoing a shift in their outlook, mindset and beliefs. These developments are rarely graceful—especially with people we see every day—which is why you should encourage them to explore new paths rather than lead them back down familiar routes. It's an incredible test of faith, but love is about trusting that everything will work out for the best. Leos are ruled by the Sun, the universal source of heat, light and life. This is what gives you your warmth, charisma and indefatigable optimism. It's also what makes you a people magnet. Like flowers craning their stems to drink in solar rays, people will turn to you for recognition, approval and love. They feel emboldened and enlivened when they're around you. It must feel wonderful to be adored, but it also can get exhausting because you're expected to be "on" 24/7. Your boss expects you to get the job done, friends come to you with their wrongs that need to be righted and loved ones rely on you to heal their emotional wounds. It can get to be too much if you don't set boundaries. Your powers of resuscitation will be put to the test from April 17 to Aug. 2. This is when you will be locked in a struggle over an intensely personal family matter. A parent may face a serious crisis, a loved one may be in desperate need or your household may be unraveling before your eyes. You will feel like you aren't doing enough to hold things together, but you are. Just showing up and being in this person's corner will be all it takes. Things may not turn out the way that you want, but they won't be as bad as you feared. In September, you will experience a major shift in planetary energies. After months of feeling like you've been running in place getting nowhere fast, you will experience a dramatic push forward. It's like all of those long hours, compromises and sacrifices you made will suddenly pay off and you'll be making progress in your life thanks to a one-time offer or opportunity in October. This is just the beginning of better things to come in 2017. The year gets off to a boisterous start thanks to Jupiter, the planet of good fortune and higher purpose, being in your sign. Jupiter will be showering you with its blessings from January through August. Not only will you experience an increase in cash flow (especially in January and May), but you'll also emerge from that romantic dry spell you've been in. Named after the Roman god of storms and fertility, Jupiter will bring much needed replenishment to that parched landscape of your horoscope. Indeed, May 3-14 could be as good as it gets when it comes to matters of the heart. Eclipses in March and September are make-or-break times for you, triggering dramatic changes in your life. You'll have to decide between the same familiar dead-end choices or embarking on something new. Jupiter in Virgo gives you an opportunity to get back in touch with your higher purpose and utilize your spiritual strengths and creative powers. This isn't easy for someone who identifies with his to-do list. The Saturn/Neptune square on Sept. 10 frees you from a long-term obligation that's been draining your time, energy and resources. The not-so-good news is that you won't have the clearest idea of what to do next—especially since this obligation (maybe it's was a thankless job or loveless relationship) gave you your sense of security and social status. Now the danger would be to go and find a situation like the one you're leaving while the more creative challenge would be to invest your energy in the things that you truly want to do. This is where your powers of visualization will make all the difference. Hold these images of the life you want to live firmly in your mind, and you'll see them begin to materialize in November. This year, you make the switch from identifying with exterior values to placing more importance on your interior ones. Contrary to what spiritual workshops say, we don't really grow because we want to; we grow because we have to. Mars retrograde in Scorpio from May 27 to June 29 introduces a deeply personal crisis that will force you to take back the reins of your life. Born under the zodiac sign of marriage and partnership, you tend to yield the field to a lover or spouse in order to make your relationship work. You don't do this to be self-sacrificing. You just believe that the whole is greater than the sum of its parts. Unfortunately, your partner isn't functioning at full capacity due to an intensely private matter, psychological baggage or financial difficulties. This is when you need to put this person in the passenger seat and take hold of the wheel. It will be up to you to do the driving for both of you until late August when you'll be on the other side of this energy. Jupiter, the planet of good fortune and higher purpose, enters Libra on Sept. 9. Named after the Roman god of rain and fertility, Jupiter showers good fortune upon you in order to make things grow. If you think of yourself as a start-up company, then Jupiter would be your financial backer. He will invest in you, but only as long as you follow a path that leads to maximizing and fulfilling your potential. And this is where the higher-purpose part of Jupiter comes in. Be true to the highest in yourself and you will make more headway between August 2016 and October 2017 than you have in years. Stray from that path, however, and you will see the lucky breaks and money dry up. Ruling planet Mars enters Scorpio on Jan. 3. This is good because you'll feel motivated, confident, and ready to take on life's challenges—like Popeye after gulping down a can of spinach. Not only are you in peak form from Jan. 3 to March 3, but you'll be making up for lost ground. If there are any love interests you want to pursue, sales you want to make or ventures you want to launch, then this is your window of opportunity. All of this changes on April 17 when Mars turns retrograde. A retrograde refers to a time when the planetary energy reverses itself. Instead of being gung-ho and driven, you will start to feel like you're losing momentum and that things are coming to a standstill. This may be based on dwindling support, or people may actually be thwarting your aims. You'll want to retaliate, but take a chill pill instead. You're not going to get what you want from May 27 to June 27, anyway, and some heavy soul searching might be in order. Scorpios tend to adopt a "do-or-die" approach to getting what they want, and your scorched-Earth policy—especially when it comes to business—may be taking its toll. Scorpios are aggressive, but they're also fiercely loving and deeply compassionate. Open your heart and try seeing things from another person's point of view. Your sensitivity isn't a weakness—it's a strength. This is something that will help you to rebuild a bridge with a loved one on Sept. 16. Bear in mind that with all of our talk of target markets and financial objectives, it's easy to lose the people for the demographic. Introduce more of that humanity into the way you do business and you will see your numbers soar in November and December. It looks like those self-help mantras and pep talks in the mirror just aren't cutting it for you, anymore. That's because Saturn, the planet of trials and tribulations, is traveling through your zodiac sign. Astrology's version of a wet blanket, Saturn dampens your enthusiasm, undermines your confidence, and sits like a monkey on your back. Expect Saturn to cast a long shadow of doubt from January to March 23. Astrologers regard Saturn as a teacher and not a tyrant; a builder, not a destroyer. But Saturn can't build on a weak foundation. It has to rip out the deadwood first. These can be failed dreams, outworn relationships or self-defeating behavior patterns. Saturn doesn't change you. Saturn makes you repeat the same routines until you are so sick and tired of being sick and tired that you make necessary changes simply because you can't stand it anymore. On May 26, the real work begins. Some of you Sagittarians may try to walk out on your job, your marriage or your responsibilities during this time. Good luck with that, because you won't get very far. That's because Saturn closes off the escape routes so that you're forced to make something of your circumstances. You see, it's the limited choices that make us resourceful, it's adversity that introduces us to strengths we never knew we had. Signs of intelligent life reappear in your universe on Sept. 9 when Jupiter enters Libra. That's when a stalled promise or a pledge comes through and your rekindled hope will blaze. Instead of things leaving your life, you'll see things enter it—but these will be things that you had tried before but didn't pursue, such as an unrealized talent, a forsworn aspiration or even an impossible love. These are the rejected stones that you will use to build your new foundation in 2017. This year looks wonky. It will feel like the universe is being contrary for contrary's sake, but it isn't. What's going on is that the stars are changing the game plan by moving the field posts. You won't like it. Born under the sign of the mountain goat, you set your sights high and push yourself to reach the summit. However, your ruling planet, Saturn, is traveling through the most deeply soulful part of your solar chart. It insists that to find the truths you seek, you must turn within. That's a problem because you don't do navel-gazing. Nevertheless, you'll be asking some big philosophical questions on March 23 when you find yourself at a crossroads. You're really great at your day job. You meet the deadlines, deliver the goods and move the ball down the field. But a to-do list is not a higher purpose. For that, you have to lift your nose up from the grindstone and take a look at the life you've created. Isn't there a project, a venture or a dream that you've always wanted to do but kept putting off because it's too far-fetched? September is a turning point for you. This is when you make changes in your lifestyle and schedule so that you can do what you were always meant to do. You'll want to start out small and build momentum over time. On Nov. 19, you will get a big confirmation from the universe that you are on the right track. Maybe it's that record company calling you back, a backer stepping forward with a check, or orders coming in for a business you started on the side. In any case, it will be proof positive that it's never too late to live the life you want to live instead of the one you feel you have to live. You'll be in peak form from January to April when Mars, the planet of gumption and drive, arcs over your solar mid-heaven. Mars is the planet of "what I want" in astrology. When Mars sets its sights on something it wants, it pursues it with the single-minded focus of a heat-seeking missile. This is the time to push for what you want, to strike a hard bargain and to climb as many rungs on that ladder of success as you can grasp. Mars is unapologetically aggressive and you will need to be the same way if you want to be successful in love and money. On April 17, you'll experience an immediate drop in energy—not unlike the fatigue that follows the endorphin rush of a really good workout. You'll feel like you should keep pushing yourself, but don't. Focus on protecting your interests instead, because they may be under fire when Mars re-enters Scorpio on May 27. This portends difficulties with men in positions of power. Maybe you were too bold, brusque or radical in your approach. In any case, it would be a good idea to remember that men have oversensitive egos. Give them a share of the spoils of their victory—like credit, acknowledgement or even a cut of the action—and they'll be fine. Jupiter enters Libra on Sept. 9. This planet is often connected to travel, and you'll be doing a lot of it in September and October. Evidently, you're quite a hit with people who live out of state or in another country altogether. Maybe you wowed them with a presentation, your wise advice or unmatched expertise. This could result in you being poached by year's end. Even if you don't follow through, it will provide you with a bargaining chip or a trump card that's worth playing in 2017. Life isn't treating you as nicely as it once did. The cash flow doesn't flow, the romantic interests don't interest and even things you took for granted—like your talent, inspiration and vision—leave you feeling unmoved. Has your creative well run dry? You can blame Saturn at the top of your solar horoscope for this malaise. The planet of fear and anxiety, Saturn stirs up our doubts and insecurities. You may feel like your time has come and gone, that circumstances will always thwart you, or that you'll never realize your true potential. And you're right. This will happen if you keep turning your back on who you are. Saturn's job is to scare you straight. Like the Ghost of Christmas Future in Dickens' A Christmas Carol or the Guardian Angel Clarence in It's a Wonderful Life, Saturn's aim is to show you what will happen if you don't wake up and smell the coffee. This comes to a head on March 23 when the Saturn/Jupiter square presages a health scare, a monetary fiasco or a close brush with disaster. You'll survive it, of course, because the point is to rock your world and change your outlook. Christopher Renstrom is the creator of RulingPlanets.com, a subscription-based interactive astrology website adapted from his best-selling book Ruling Planets, published by HarperCollins in 2002. Christopher also writes daily horoscopes for The San Francisco Chronicle and SFGate.com. He created and wrote the horoscope column for Allure magazine from 1991 through 2009. Now the exclusive astrologer for Patti Stanger (the Millionaire Matchmaker), his weekly forecasts appear on Sheknows.com. Christopher teaches astrology classes and workshops here in Salt Lake City.